We're deep into Autumn here in South Africa and my Kiepersol is already starting to lose its leaves. Time to stop watering so much, but we've had quite a bit of rain over the last week, so hope it dries out before the real cold weather hits. This evergreen tree NOT so evergreen here in Tarlton!) 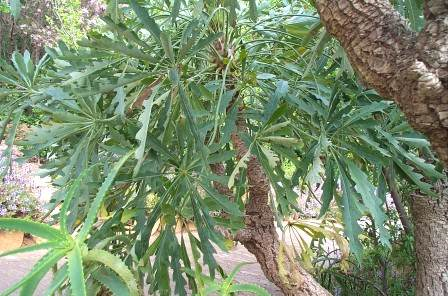 makes a beautiful focal point in a garden as it has an unusual shape, interesting gnarled bark and stunning, large, gray-green leaves. It is a short, thick-set tree, rarely exceeding 5 meters in height, therefore making a perfect garden specimen. Even though it is an evergreen, we live in a heavy frost area and my tree loses its leaves in winter, but has always bounced right back every spring. The plant is native to southern Africa : Botswana, Lesotho, South Africa (Cape Provinces, Northern Provinces, KwaZulu-Natal) and Swaziland, where it grows till 2.000m of altitude in the savannah and the mountain slopes, usually in the rocks fissures. 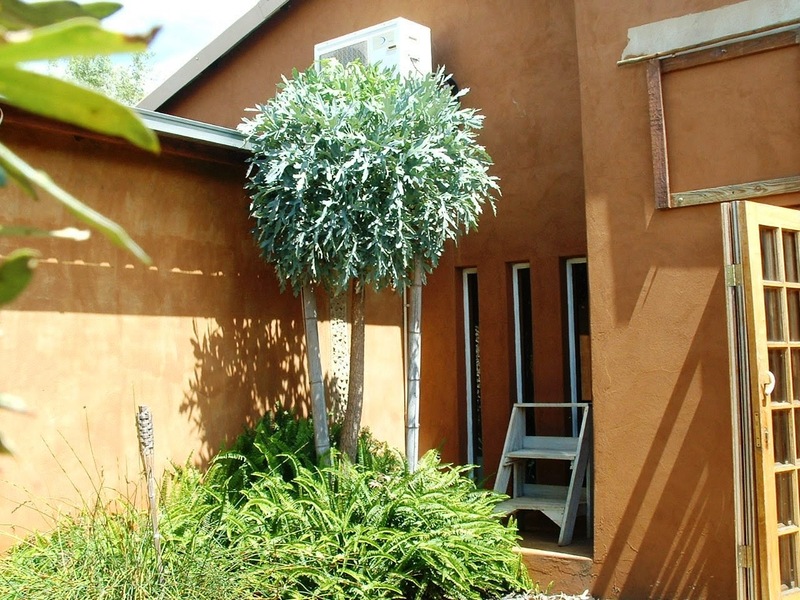 The Highveld cabbage tree (Cussonia paniculata) is cultivated from seed, preferably fresh. 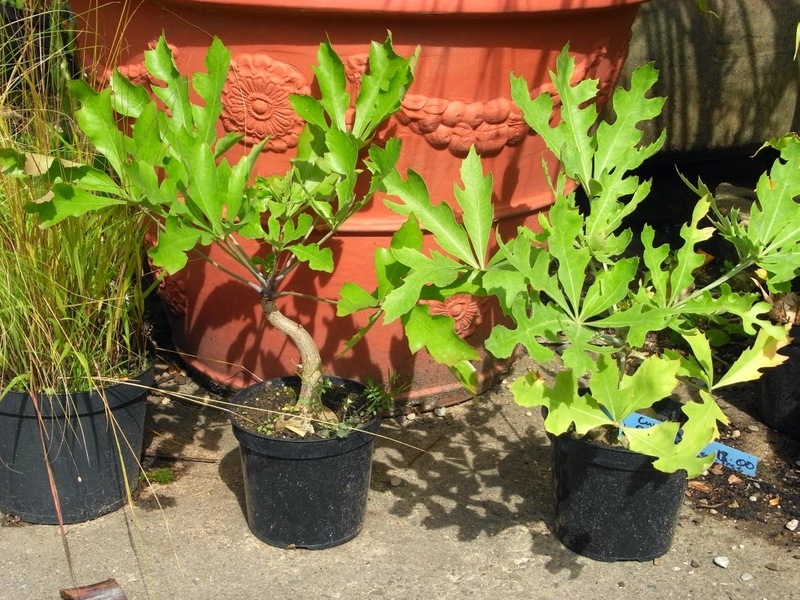 One can grow Cussonia paniculata from a cutting, but this is not advisable because it does not make the proper, fleshy, underground rootstock that it forms when grown from seed. The seeds should be planted in a well-drained mix of river sand and compost (70:30). Germination is erratic - the best results have been obtained with seeds that have been "passed" through birds (Look for the seeds underneath the tree....). First germination occurs after about 2 weeks. The C. paniculata is an ideal pot plant (plant it in a big pot in a well drained mix), or can be planted as a single specimen or in a cluster - the effect is always striking. Growth rate is about 70cm per year, depending on the climate. The tree is drought hardy and is able to withstand heavy frost after 2 years. Sow seed as soon as possible as it loses much of its viability within 3 months. However, seed sown in summer months will germinate faster (in about 4 weeks) than seed sown in winter (7 weeks to germination). Put a mix of rich soil and compost into your seedling trays and place the seeds into them. Cover the seeds to a depth of 5mm with the soil and mulch. Keep moist during germination. When the seedlings get to a “2-leaf” stage (about 4 months), plant them out into larger black nursery bags. Make sure seed trays are at least 15 cm in depth to allow the small tubers to form. Do not allow seed to become waterlogged or dry out. Keep seed and seedlings in a semi-shaded area or, if you are planting the seeds now, during winter, keep them indoors in a sunny place, but not sun shining through glass as this can burn the plants.